The computer is back and running super fast, which is delightful. Therefore I can post as many pictures as I like, and I shall. This post will be low on words and high on bounty. I love this time of year; nothing is better than picking your breakfast, lunch, and dinner. This was my first handful of ripe beans; now they are coming thick and fast and we're having them every other day. I went back to an heirloom that I grew many years ago and loved, and I think I always will stick with this one from now on. The variety is 'Rattlesnake,' and I adore the striping and the taste, which is best when the beans are still very young. I grew, from seed, hundreds of sunflowers this year, and gave away most. I planted about 50 in the garden, though, and we have enjoyed them so much. Some are knee-high, some are higher than our fruit trees; some are red, some brown, some yellow; all the centers have been different colors, from dark to light; the bees have loved them all. Is there any more cheerful flower? The biggest tomato yet - a variety called 'Dester' - this one is over a pound. Butternut squash and pumpkins have started fruiting. We use a lot of paprika in our cooking, so my 'hot pepper goal' this year (I seem to have a hot pepper goal every year) is to make our own paprika, both regular and smoked. To that end I planted four varieties of Hungarian paprika peppers. Adam has been enjoying them green and fresh on sandwiches - he says they are extremely mild - and now they are starting to change color, so soon it will be time to experiment with making powder. The Four O'Clocks re-seeded and are blooming everywhere at dawn and dusk, lighting up the garden with their neon pink. The 'towel of awesomeness' is back in play. I bring the tomatoes in just after they have 'broken' - that is, just started to change color - and leave them on a towel to ripen. It works great, and the squirrels don't get a share. 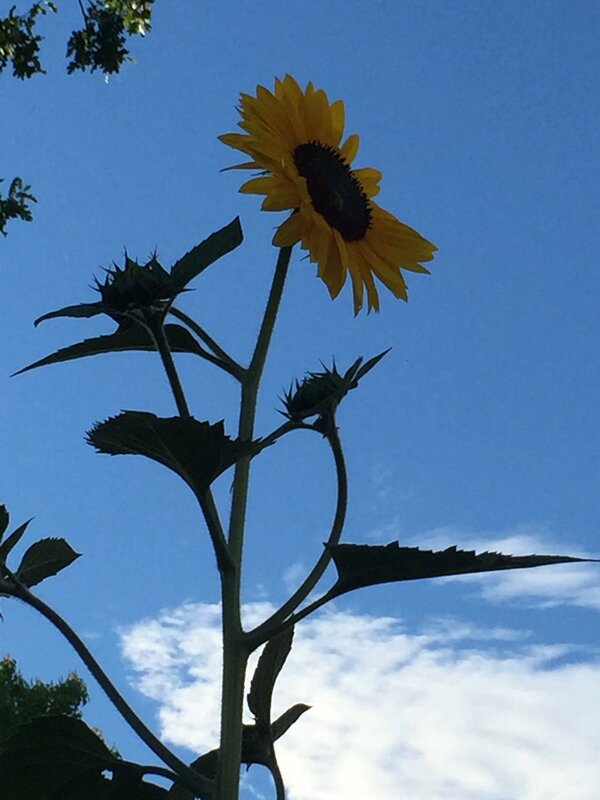 Our tallest sunflower, against a beautiful California sky. 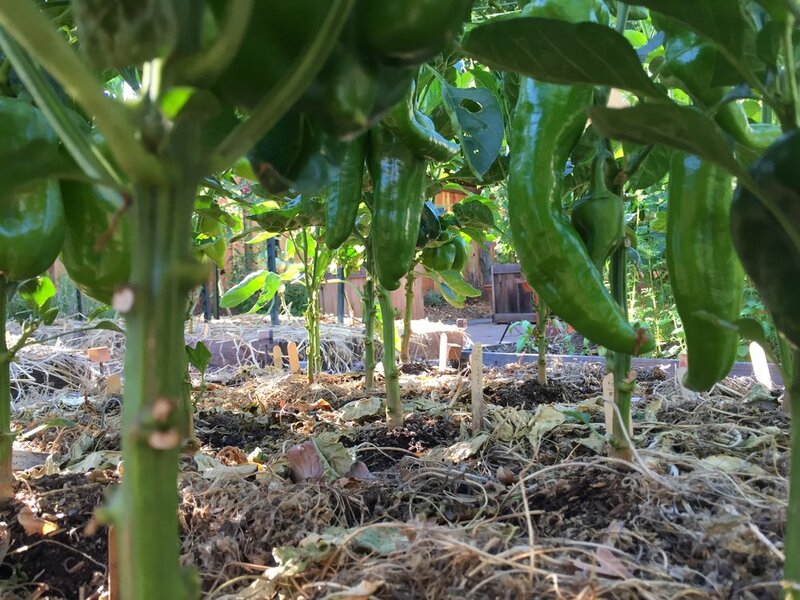 There's lots of sweet peppers hanging from the plants. It's hard to wait until they start to change color! Zinnias and cosmos are my staple summer flower, and I seed them in every corner I can find. Finally, they are starting to bloom. We're still getting strawberries and blueberries every day. The blackberries are also starting to ripen. And lastly, here is the July wreath. I made it out of wild cherry plums that grow down by the (now dry) creek in the open space (Prunus cerasifera). This one has a half green, half red foliage, which is very pretty. Despite the heat and the dryness, I love this time of year and all the bounty the garden provides. I didn't even show you the baby cucumbers, or the melon blossoms, or the piles of basil being harvested for use in pesto, tomato salads, Bahn mi sandwiches, or Shakshuka. Soon we will be canning and pickling on every weekend, which makes us so happy. 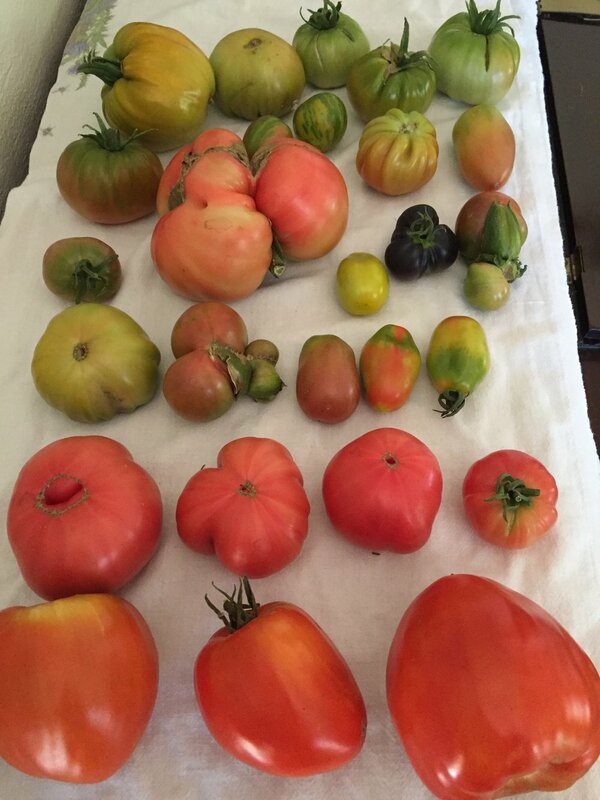 What are you harvesting in your garden?